Streamline the retail checkout process for your employees and customers. 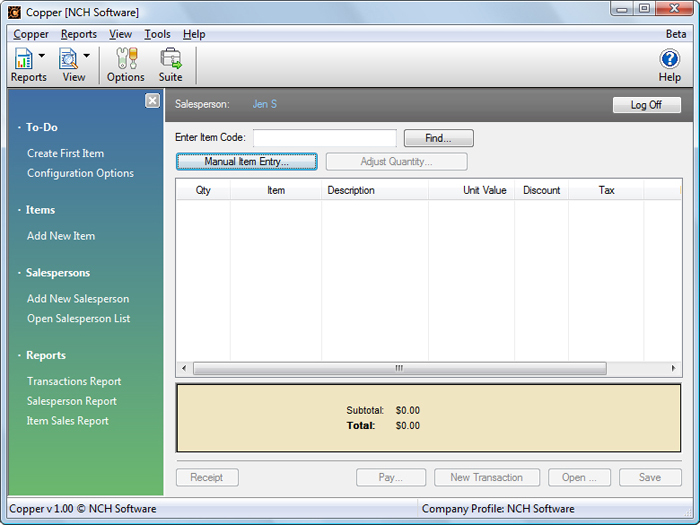 Copper point of sale software (POS) provides businesses with a cash register system that stores product information, making the checkout process quicker and more accurate for your customers and your records. Data backup/restore feature to keep data safe.Run multiple businesses from one installation.Installs and ready for printing in less than a minute. Streamline the retail checkout process for your employees and customers. ...... The POS system can also apply discounts and promotions, report on sales by salesperson or item, and is an asset in inventory management. When the sale is complete, provide customers with a professional itemized receipt of the purchase. Receipts can be customized with your marketing messages or your business logo, and can be configured to print on large or small paper. Point of sale is the time when the company's actual sale takes place. Qweas is providing links to Copper Point of Sale Software 1.03 as a courtesy, and makes no representations regarding Copper Point of Sale Software or any other applications or any information related thereto. Any questions, complaints or claims regarding this application Copper Point of Sale Software 1.03 must be directed to the appropriate software vendor. You may click the publisher link of Copper Point of Sale Software on the top of this page to get more details about the vendor.